Problems with mosquitoes in your house can be a real nuisance, but more importantly, mosquitoes carry deadly diseases like malaria, West Nile virus, dengue fever, chikungunya, and Zika. Getting rid of these pests often involves chemical agents. But, don’t worry, I’m going to show you how to keep mosquitoes out of your house and how to keep mosquitoes away naturally. We will discuss how to keep mosquitoes out of your house, and how to get rid of mosquitoes inside the house using home remedies to kill mosquitoes. I hope my methods work for you, they have made a big difference at our house and allowed us to enjoy the summer months more. Prevent mosquitoes from entering your home by patching screens, caulking up holes and using weather stripping products to seal gaps under doors. Keep your doors closed whenever possible. Preventing mosquitoes from coming into the house simplifies the battle. Camphor is one of the best natural mosquito repellents, so use it to drive mosquitoes out. Put one camphor tablet in a small bowl of water and place it in the room. Mosquitoes leave the room because of the odor. Replace the camphor every 2 to 3 days to keep repelling mosquitoes. Use camphor wherever mosquitoes are a problem. Mosquitoes only need a few drops of water to reproduce. If you have an ongoing problem with mosquitoes, look for areas of standing water in the house. Check your plants, flower vases, bathroom and shower areas for pockets of standing water that might be harboring the next generation of mosquitoes. For areas where water is necessary, such as a flower vase or dog bowl, completely change the water daily. Porch lights and door lights draw in mosquitoes, and they can quickly get into the house when the door opens. Avoid attracting them by keeping the lights off or dim, or by replacing white lights with yellow ones. 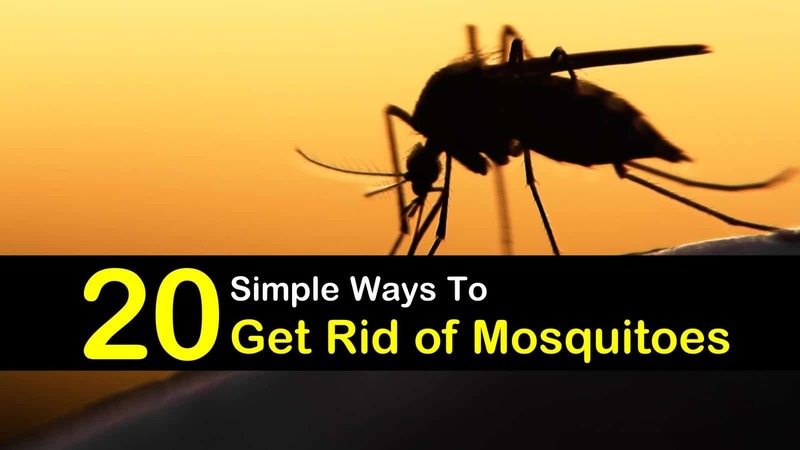 These are just a few of many ways of how to repel mosquitoes. Depending on the type of mosquito different scents might work. Citronella oil is a natural mosquito repellent that will kill mosquitoes and drive them out of your house. Look for citronella candles or use citronella essential oil in your vaporizer or oil diffuser. Many essential oils repel mosquitoes, and burning candles that contain these scents are an efficient way to keep mosquitoes out of your home. It is easy to find candles in stores or make your own using the essential oils in your fragrance mix. Try different candle scents to keep mosquitoes out of your house. Holy Basil, or Tulsi, is a useful mosquito killer and repellent. Plant holy basil in containers in your home to keep mosquitoes away and rub the oil on your skin for an effective repellent. Peppermint plants have a pleasantly relaxing smell that mosquitoes do not like. You can use this to your advantage by planting peppermint with your houseplants or use peppermint essential oil in a vaporizer or diffuser to fill the room with the scent. You can also apply peppermint oil to your body like a mosquito repellent. Garlic is a natural mosquito killer and repellent. The strong odor of garlic prevents mosquitoes from biting and drives them out of your home. Use garlic in your cooking and get double benefits. The cooking aromas will drive them out of your home and eat garlic will keep mosquitoes from biting you. A very simple mosquito trap can solve your indoor mosquito problem quickly. Mosquitoes are attracted to water; it is necessary to breed the next generation. While you should normally get rid of all standing water that might attract them, you can also use it to trap them. Place a small bowl of soapy water in a discrete location in each room. The water will attract them, and the soap will trap them, drown them, and prevent the next generation. If mosquitoes in the house are a problem, you will probably want to wear mosquito repellent throughout the day. Many commercial products work well, but they come with risks, especially for everyday use. However, our natural solutions are just as practical and perfectly safe. Here are our best suggestions for keeping mosquitoes away from you. The insects have trouble flying in the rapidly moving air and will have to relocate. While this solution is only temporary, it can allow you to enjoy your outdoor space more often. For best results, use several fans, set on high, and cover the entire space with a cooling breeze. Many perfumes attract mosquitoes to you. If you seem to be eaten alive by mosquitoes, it may be your perfume. Stop wearing it for a few days to see if it helps. If you feel you must wear scent, try an essential oil blend that contains the oils of plants that mosquitoes hate, such as lavender. Mosquito nets are an old but practical solution to the mosquito problem. Use mosquito nets to surround your bed and keep mosquitoes away. Don’t forget to cover your baby’s crib with mosquito netting also. Netting is a good solution in areas with a high mosquito population. Hang the nets from the ceiling or the bed canopy and surround the bed. Raise the net to get into bed, then replace it with a barrier and a good night’s sleep. Dryer sheets are reported to help repel mosquitoes. I haven’t tried this method personally, but I would use a scented lavender sheet for best results. It is also a great way to keep spiders away. Some people might be allergic to the dryer sheets, so avoid using dryer sheets if you have sensitive skin. If a mosquito does land on you, kill it. But here is the best way to swat them. For best results, don’t react immediately. Give the mosquito a minute to settle in and get ready to bite. Then attack quickly with a fast slap. Usually, if you slap them immediately, they are on the lookout and will get away. Once they have relaxed their diligence, you can swat them more reliably. Neem oil is a natural insecticide and repellent. In its concentrated form, it can cause skin irritations in some people, so always use it diluted with coconut oil, olive oil, or another carrier oil. Neem oil has a strong smell that some people find unpleasant so that you can use other essential oils in the mix for a better fragrance. Our Neem Oil Spray recipe is designed to fit into a small 30 ml bottle. Mix it directly in the bottle and spray onto all exposed areas of skin every 8 to 12 hours. >> Extra Tip on Neem Oil: It is one of a few home remedies to get rid of bed bugs too. This mosquito repellent combines the strongest mosquito repelling essential oils to make a spray that will last for 8 hours or more. Mix the ingredients in a small spray bottle. Keep the mixture in the refrigerator for a cooling mist during the hot summer months. Tea tree oil is an extremely versatile oil with many benefits for your skin. It is a powerful antifungal and antibacterial agent that helps skin heal. It also repels mosquitoes. You can place a few drops of tea tree oil into your vaporizer to keep mosquitoes out of your house, or use a few drops on your skin as a mosquito repellent. Unlike many mosquito repellents, lavender has a sweet smell, which makes it the perfect choice for regular use to keep mosquitoes at bay. Lavender has been reported to bother mosquitoes and prevent them from biting. Use lavender oil as a room freshener to keep mosquitoes away or apply it to your skin for a pleasant mosquito repellent. Mix a drop or two of lavender essential oil into your usual moisturizer or body lotion and use as usual. Not only will a fan provide cooling air for you and your guests while you use the patio, but it also keeps the mosquitoes away. Fill containers with plants that naturally repel mosquitoes to keep them away from your patio and indoor spaces. There are many plants that mosquitoes hate, so you can choose the plants that best suit your decor. We’ve talked about the essential oils of some of these plants already, but if you have a green thumb, the plants themselves could be your answer.